I seriously doubt anyone could've guessed what we were having. Both Lindsay and I were a little stumped when we heard the news, because it really wasn't what we expected. We had had dreams about our little baby and what it was supposed to be. Oh well, we are still happy with the results of the Ultrasound, and can't wait for peanut to get here. Ashley (our sister-in-law), came with us and took video of part of the Ultrasound, SO when we get that we will post it so you can see how long it took her to tell us what we are having. In other news, I am finalizing school preparations, and unbelievably can't wait to start. I really am looking forward getting into my degree, and taking classes that will propel me closer to a career in the IT industry. Lindsay has been a HUGE, and I literally mean HUGE, help. I say that because she doesn't think she is getting any bigger as she gets further along in her pregnancy, but she has gained 6 pounds in four weeks. Thats news! Some people get big fast, others take their time. Lindsay likes to pace herself... I guess she doesn't like it, she just can't have it any other way. Despite her best attempts. Tonight we attend the greatest event since I have brought in to this world, and since Lindsay and I got married. Tonight we see, SEINFELD! Jerry is doing a two show stop in Raleigh tonight and Lindsay got two tickets for my birthday, I am taking her with me to say "thank you!" This is an unofficial/official anniversary weekend for us. Monday is the real day, butwe are going to spend the weekend together and enjoy the spoils of a year of friendship, and love. How did I get so lucky! She is so funny and makes me laugh all the time. We are going to have a very relaxing and easy going anniversary. WE MADE IT! 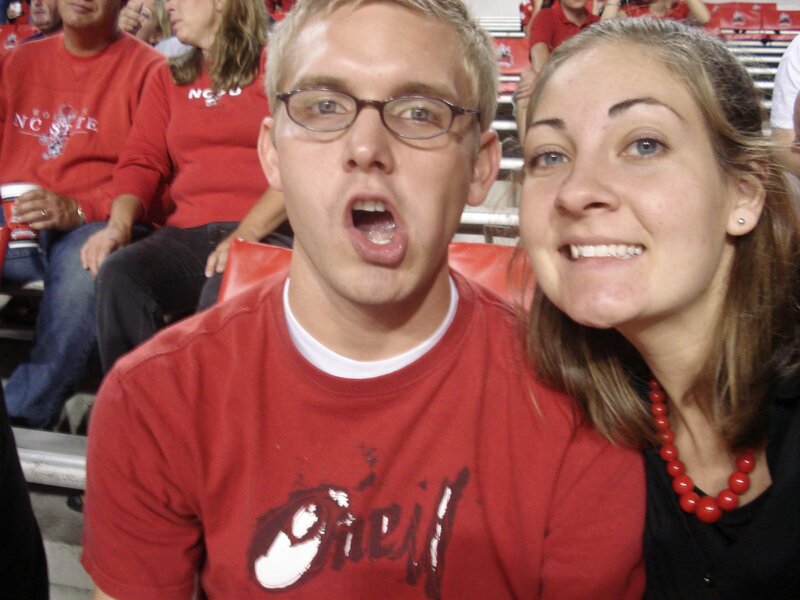 That is a picture of Lindsay and I at an NC State game. Her parents have season tickets and they brought us with them. Thanks a bunch!